From the pages by Lee Davison. 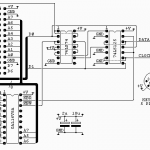 This is a simple ROMable file system for 6502 based computers. It was designed to hold all the web content for my Vic 20 web server and so only has the features needed to support that. As it’s intended for use in embedded type applications the filesystem needs to be small and require few system resources. The system presented here uses only four bytes, apart from the filename to describe each file and directory. The routine to find a file needs only eleven bytes of RAM, apart from the filename to be searched for, only six of which need to be in page zero and none of which need to be maintained between calls. Files and directories are basically the same with just one bit changed in the header to tell them apart. There are no blocks or block mapping, no file dates or times, there aren’t even the pointers to reverse traverse the file tree, though they could fairly easily be added. Files consist of a header and the payload. The header is from four to 259 bytes long and is made up from a flag byte, a length word and a null terminated filename. File names are case sensitive, can be up to 255 characters long and can include most characters, only “/” and $00 are expressly forbidden. The payload is just binary data and can be any size, including zero bytes. A directory is the same in form as a file except b6 in the flag byte is set. The payload is a list of word size pointers to the headers for each of the files and directories within the directory. There are no end markers or guard bytes or any special way of marking the start and end of each file. The only point that must be known is the start of the root directory from which the pointers to all other files and directories can be found. Files do not need to be in contiguous memory and can be placed as and where is convenient. 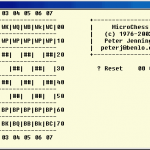 The first byte in the header, the flag byte, only has two bits defined and of those only one is used at present. b7 is the deleted bit, if this bit is set then this file or directory has been deleted. b6 is used to distinguish a directory file from a non directory file, if this bit is set then this file is a directory entry and as such is treated slightly differently by the filesystem. The header flag byte has only b7 and b6 defined, all other bits are available for any use such as hidden, system, executable, read-only or archive bits. The deleted flag is not used as such and, with a small code change, could also be assigned to other uses. The second and third bytes in the header make up the file payload length word, this is length of the file’s contents. The file payload length is limited only by the space available but in practice will usually be small enough to fit in a single ethernet packet. The fourth byte onwards of the header is the null terminated filename. There are few restrictions on the name aside from the maximum length which, excluding terminator, is 255 bytes and the character “/” and the byte $00 are not allowed. No other characters are expressly forbidden, but the use of non-printing characters is not recommended. Directories are distinguished from files only by the state of the directory bit in the flag byte. This means no special code is needed to search for directories instead of files as, during searching, both are treated the same. The down side to this is that you can’t have a file and a directory with the same name, only the first listed in the directory would ever be found. The payload in a directory is a list of absolute word pointers pointing to the start of each of the files and directories to which the current directory is the parent. No end marker is needed as the end can be dreived from the length so there is no restriction on the location of files. Though the entries in the example above have been arranged in directory then file alphabetic order this is not a requirement and any order is as valid as any other. No significance is placed on file ordering except where duplicate filenames are concerned. In this case only the first occurance of the duplicate filename will ever be found in a search. The root directory is exactly the same in form as any other directory, what makes it special is that it is not pointed to by any pointer in any other directory and so it’s location can only be refered to explicitly. For this reason a name is not needed, it can never be searched for, but could be used as a volume name or distinguishing information in a system where more than one volume may exist or the volume is held in removable media – a flashcard for example. If the root is always held in the same relative place it makes handling multiple or removable volumes much easier. The header of a file is the same as that of a directory except the directory bit in the flag byte is clear. The payload is just binary data and there is no end-of-file marker needed as the end of file can be derived from the length. Because of this there is no restriction on what the payload may contain and there is no significance in the filename or it’s extension (if any). All file payloads are of equal significance, i.e. none, as far as the filesystem is concerned. The only software provided is a routine to search the file system tree for a particular file. The filename to search for should be the complete path from the root, start with a “/” character and be null terminated. Directories are separated with the “/” character. As this code is intended for a small web server there is the feature that any search terminating in a directory will automatically append “index.html” to the string and search that filename. The code presented only allows searching of the file tree and there is no code to add or delete files or directories. You can either download the source as zipped text or view it as html. If 64 kilobytes, the limit for this system as it stands, is not enough the filesystem can quite easily be expanded by extending the directory pointers and payload length to values big enough to handle the required size. With 32 bit words up to 4GB of paged or externally stored data could be handled with a minimal increase in code complexity, more than enough for most 8 bit microprocessor systems. filesys is the pointer returned by the find routine, it is only valid if a file was found, i.e. Cb is = 1.
lensys is the length of the returned file and like filesys is only valid if a file was found. file and length are used internally by the find routine. fileflags is used internally by the find routine. findname points to the start of the null yerminated path/name of the file to find. Like the HTTP “GET” it must start with “/” and “/” is used to separate directories so “/”,$00 is valid as is “/index.html”,$00 but “o.html”,$00 isn’t. ; file format is .. This is used to define the header, f_name is used realtive to f_start and will remain correct even if other parameters, such as a parent pointer for reverse tree searches, are added to the header. ; name will be searched for the path given. ; in the name if the whole name matched. 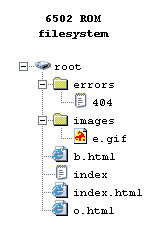 The routine above is the main file tree search routine. The path/name to find is compared byte at a time with each filename in turn until a file is found that is a complete match to it’s end. Once there the find string is tested and if it’s at a separator, “/”, a directory change is made (assuming the found file was a directory), the search then continues. If the find string ends in “/” then the pointer is changed to point to the default file name “index.html” and this file is searched for in the target directory. So “/” as a find string will search for, and return, the pointer and size for “/index.html”, where as “/images/” as a find string will search for, and fail to find, “/images/index.html” as there is no index.html file in the images directory. Finally the test filesystem files. There is one additional, zero payload length, file “index” which is to test that matches with partial names don’t trigger false matches. ; file to test the file match. ; structure for this trial is ..